Half-hardy evergreen or semi-evergreen azalea with small, lanceolate leaves, often turning crimson or purple in autumn and widely-funnel-shaped, red to scarlet flowers, but very variable. To 1.8m. [RHSD, Hortus, Hilliers', Millais]. This is the plant for which the entire group is named. Long cultivated in Japan in great variety. ‘This is a very rare plant, which has been long anxiously sought for by cultivators of curious and scarce exotics. We believe there are not above three or four individuals of it in the country, and of these only the one in the collection of James Vere, Esq. from which our drawing was taken, has as yet produced any flowers. It is surprising that this shrub, so famed for its elegance, and of which Kaempfer [in 1712] enumerates twenty-one varieties cultivated in Japan, should still be so rare in Europe, especially when we learn that it flourished, for twelve years, in the garden of Mynheer Jerome van Beverninck, one of the most celebrated in Holland, producing annually a profusion of flowers, to the admiration and delight of the amateurs. Prof. Herman declares that, but for the want of fragrance, you might say of it, that nature had never produced anything more lovely; and even this deficiency might be said to be amply recompensed by its delightful structure, and exquisite brilliancy of colour of its flowers. Among the varieties enumerated by Kaempfer, besides the many different coloured flowers, white, red, yellow, purple, and scarlet, with spots of the most contrary hues, the foliage of some is hairy, of others smooth; some produce their flowers before the leaves, some after; others are evergreen; some have five, some ten stamens. The variety cultivated in Holland was brought from Jaccatra; its foliage hairy and evergreen; flowers of a refulgent pale crimson colour, and produced in such profusion from June to August, that the upper part of the shrub looked as if covered with a beautiful crimson garment.’ [BM t.1480/1812]. Kaempfer’s descriptions strongly suggest that many of these plants were hybrids. A cluster-flowered form, with purple flowers, was also figured. [BM t.2667/1826]. ‘This superb plant was introduced into this country about the year 1810. It flowers in the spring, and is a native of China and Japan, in which countries many other varieties, and perhaps species, are cultivated […] any of them would be highly desirable could they be brought home alive, which is a difficult matter.’ [LBC no.275/1818]. Listed only in the 1857 catalogue [T.111/1857]. Azalea indica lateritia Lindl. was amongst azaleas notated ‘died’ following a shipment requested of Loddiges’ nursery on 13th February, 1848 [MP A2933-1, p.172]. It may have been replaced as it was requested again on 1st February, 1849 [MP A2933-1, p.185]. The record indicates that azaleas and rhododendrons performed poorly at Camden Park. Indica azaleas: The Indian, or Indica azaleas are a large group of mainly tender hybrids developed in Belgium and England, and to a lesser extent France and Germany, during the 19th century. Several species are involved in their parentage including Rhododendron indicum Sweet, Rhododendron simsii Planch. and Rhododendron mucronatum G.Don. R. simsii was, and still is, often called Azalea (Rhododendron) indica in nurseries. The flowers in the Indica group are typically large, 6 to 7.5cm across, funnel-shaped, and vary from red to scarlet in colour. R. mucronatum has white, occasionally pink, flowers, and R. simsii has clusters of rose-red to dark red flowers with darker spots. [Hilliers']. Rhododendron simsii was frequently sold as Rhododendron [Azalea] indica in the 19th century and later. 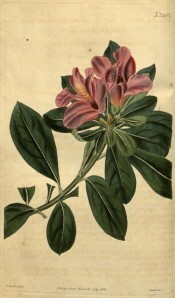 ‘For nearly a century and a quarter this plant [Rhododendron simsii Planch.] has usurped the name indicum, and in books is almost hopelessly confused with the true R. indicum Sweet, with R. obtusum Planchon and its varieties, and with R. scabron D. Don. […] Sims was the first to figure the Chinese species (Bot. Mag. t.1480/1812) under the erroneous name of Azalea indica, and states that it was a rare plant in England and that the only one that had flowered was in the collection of James Vere Esq. In the Kew Herbareum there are two specimens from the Jardin de Luxembourg collected in 1822 and 1823. These are the oldest cultivated specimens I have seen. Sweet in 1832 gave it a varietal name, and says that the plant was imported in the East India company’s ship “Orwell” from China by Mr. Tate.’ [Wilson & Rehder p.46]. To further complicate the picture, in early Victorian literature there is considerable confusion in the naming of varieties and hybrids, even species, of azalea. Most of the Azalea indica varieties grown by Macarthur are probably hybrids but for simplicity I have designated all of the plants named Azalea indica by Macarthur as forms of Rhododendron indicum Sweet, with the appropriate varietal name, unless specific information is available on parentage. It is not always possible to distinguish in the literature between plants that are truly different in form and those different only in name and a number of the plants described as distinct species or varieties here are likely to be identical.